1 What Is Retrograde Amnesia? 3 What is Anterograde Amnesia? There are two common forms of amnesia. Retrograde amnesia and anterograde amnesia. Amnesia is usually caused through an amnesic syndrome, which is connected with memory loss by way of brain damage, disease or a psychological trauma. Amnesia can also be the case after taking various sedatives and hypnotic drugs. Memory loss can be totally lost or just partial memory. This can also be permanent or temporary depending on the amount of damage caused. Most cases of amnesia have been found to be associated with damage to the medial temporal lobe. 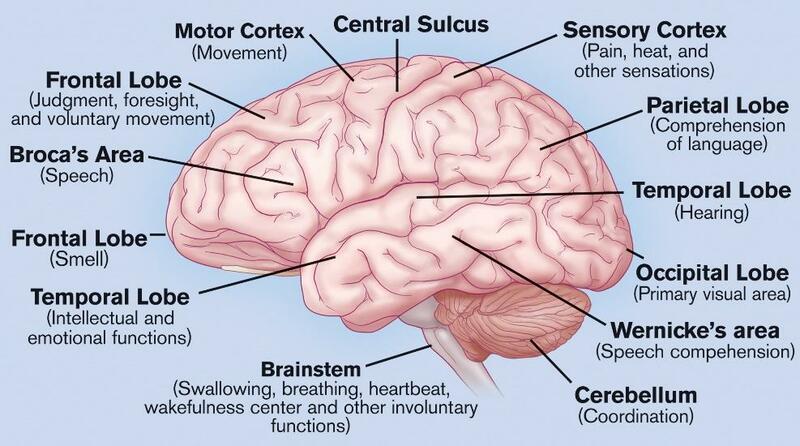 The temporal lobe is one of the main lobes found in the cerebral cortex. Its location is under the lateral fissure on both of the cerebral hemispheres. The temporal lobe processes meanings in connection with the visual memory, the comprehension of language and emotions. Structures of the temporal lobe that are critical for long term memory are the hippocampus which forms memory and the medial temporal cortex, that is critical for memory storage. Identifying familiar objects. A less common symptom is difficulties in recognizing familiar faces and facial features. Emotion symptoms will include mood changes, lack of attention and aggressive behavior towards themselves and others. Language symptoms are loss of speech, inability to read and write, and loss of vocabulary. Mental time travel collections from a person’s life containing experiences, objects, people and more importantly a specific time and place. The long term memory that stores personal experiences like entering a specific building for the first time or passing a driving test. Victims of Retrograde Amnesia usually have no difficulty in learning new knowledge. Meaning that their procedural memory (memories that are retrieved for the execution of a procedure like tying shoes, driving a car and reading) is left intact. Retrograde Amnesia usually follows damage to areas of the brain. One area that is not affected is the hippocampus which is the part of the brain that stores new memories. The extent of memory loss depends on how severe the case is. The more severe the case is, the farther back in time the memory loss will extend. Alcohol patients who suffer from the lack of vitamin B1 because their diet mostly consists of hard alcohol intake, which does not contain the necessary nutrients for healthy brain development and maintenance. Infections that pass the blood-brain barrier can cause brain damage. Any surgery on the brain whether minor or severe always carries the risk of traumatic stress upon the brain that can result in memory loss. 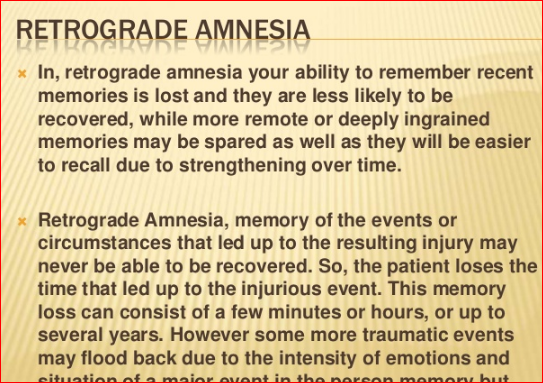 Anterograde amnesia is the inability to create new memories after the event that caused the amnesia. They have full memories leading up to the amnesia but they cannot hold new memories to recent events from yesterday leading back to the amnesia. This is the complete opposite of retrograde amnesia where people can produce and store memories after the amnesia but lose all memories leading up to the amnesia. People suffering from anterograde amnesia may witness certain degrees of forgetfulness. More severe cases have had a combination of anterograde and retrograde amnesia. 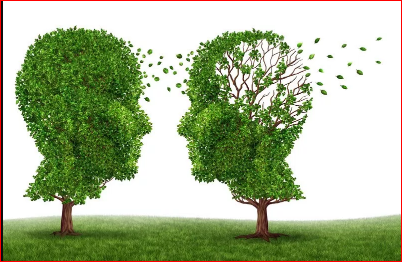 This condition is better known as global amnesia as it is total memory loss containing memories leading up to the amnesia and memories after the amnesia. Midazolam, flunitrazepam, lorazepam, temazepam, nitrazepam, triozalam, clonazepam, alprazolam, diazepam and nimetazepam, which are drugs known to have powerful amnesic effects. Usually by damage to the hippocampus and surrounding areas but can also be caused by a shock event or an emotional disorder. Although this is very rare, it can be caused by way of inflammation of brain tissue known as encephalitis. One common type of encephalitis is herpes simplex syndrome (HSV) which can lead to neurological deterioration if left unattended. patients with tumors who undergo surgery very often will receive damage to the hippocampus and surrounding tissue resulting in amnesic syndromes. Temporary anterograde amnesia can also be caused by excessive alcohol intoxication. This condition is better known as having a blackout and not being able to remember the time while under the influence of alcohol. The first signs of retrograde amnesia are usually fake memories, confusion or brain coordination problems. These symptoms are similar to other types of amnesia. The only real symptom of retrograde amnesia is the forgetting of past events and not new ones. Anybody that experiences any of the symptoms should seek medical advice immediately so that a proper diagnosis can be made to determine if you have amnesia and how severe it actually is. Doctors will probably interview a patient through a range of questions to determine the cause. These questions will include family history, drug use, prescription and nonprescription drugs, alcohol use, recent head injuries, what a patient can and cannot remember and any other symptoms. Jogging of memory, undertaken by exposing patients to past experiences in the hope of speeding up the recovery time of the brain. Supplements, for those patients with nutritional issues. Medications, while medications may improve symptoms there is no guarantee of full or even partial memory recovery. Technology, keeping track of daily events through the use of an electronic calendar.